The Miu Miu Noir sunglasses feature a retro and unique acetate design with a fun pentagon shape, thin metal bridge and temples. 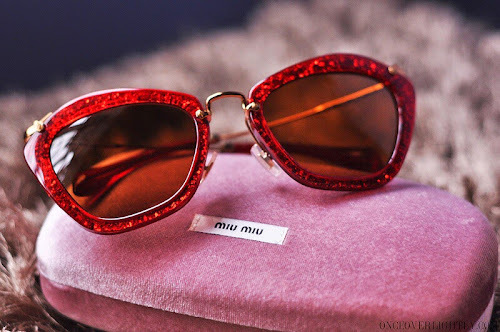 The Miu Miu Noir sunglasses are inspired by forties, frame is covered in glitter and tortoiseshell, they have a distinct sense of Old Hollywood glamour about them. Take your pick from gold, silver and red glitter, black, or tortoiseshell with a pink or blue lens.